The Dynamic Assist is a custom articulated ankle-foot-orthosis with two spring-like hinges, medial and lateral, to provide up to 15 degrees of dorsiflexion of the foot at the ankle joint during the swing phase of gait. 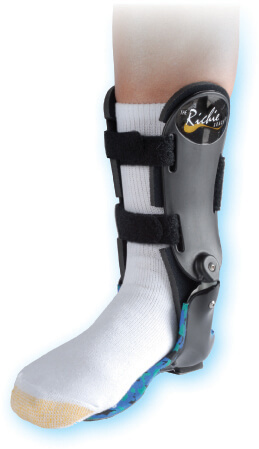 The Richie Dynamic Assist Brace® is an alternative to traditional AFO therapy for dropfoot because the brace has a comfortable, low-profile sport brace design. It also has a custom, balanced foot orthotic that contours to the medial and lateral arches and balances forefoot to rearfoot deformities, much like a podiatric foot orthotic. The orthotic footplate can incorporate standard podiatric modifications including accommodations, forefoot posting and sweet spots. The dynamic hinge is anatomically aligned to allow a comfortable pure sagittal plane motion according to the patient’s own unique axis of rotation. The casting technique utilizes the standard Richie Brace® protocol with three strips of plaster or the STS Ankle Sock. The Richie Dynamic Assist Brace® is now available utilizing the current standard Richie Brace® Prescription form. Just designate at the top of the form “Dynamic Assist” and complete the form according to the footplate prescription requirements.